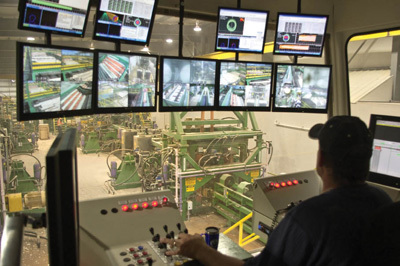 In what is the largest sawmilling investment in North America in recent years, Alberta’s Millar Western Forest Products has invested $50 million and rebuilt its Fox Creek operation into a state-of-the-art sawmill that has already achieved 100 per cent of daily production design capacity. On Thursday August 28th 2008, the Fox Creek, Alberta sawmill recently acquired by Millar Western Forest Products—and steadily headed up a steep improvement curve—was breaking production records. That all changed the next day at 4:30 p.m., when a fire broke out that gutted most of the sawmill in just four hours. Thankfully, no one was injured. Millar Western says mill employees followed company emergency procedures and were successful not only in protecting their personal safety, but also in confining the fire so that other site assets were left undamaged. 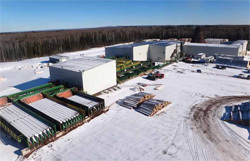 Already running sawmills in Whitecourt and Boyle, Alberta, Millar Western had acquired the Fox Creek mill from Mostowich Lumber in August 2007, and operated it for only a year before the fire. An electrical fault in a motor control centre was ultimately identified as the fire’s cause. An operator in the control room monitors production on both breakdown lines at Fox Creek (above). Millar Western Fox Creek operations manager Tom Thompson (left) notes that after just a few months in production, the sawmill is already producing at better than design capacity. While the loss of the mill was a blow, the subsequent commissioning of a new $50 million sawmill, capable of twice the production with the same number of employees on the same site, has become a source of pride and joy for company employees and the Fox Creek community. 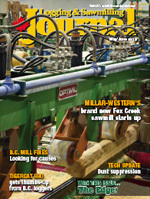 Millar Western’s new Fox Creek sawmill began production in late November 2011, and has got off to an excellent start. The sawmill was built to deliver 120 million board feet of lumber per year, with employees working single 10-hour shifts, Monday to Thursday. Within 31 operating shifts, the mill’s 68 employees had already achieved 100 per cent of daily production design capacity, and have since surpassed that goal. 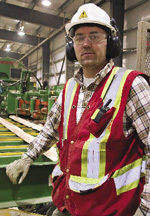 “The equipment makes it possible, but the employees make it happen,” says Stefan Demharter, general manager for the Millar Western Wood Products Division, quoting the company’s CEO and giving full credit to Fox Creek employees for their achievement in bringing both the sawmill and planer mill back to full production. A number of Fox Creek employees had transferred to Millar Western’s Whitecourt sawmill after the fire, and many returned to Fox Creek. Both returning and new employees were given extensive training at the Whitecourt mill before taking up their positions in the new mill. Fox Creek operations manager Tom Thompson says that training has paid off. “We give a lot of credit for our smooth start-up to the managers and employees at Whitecourt, who made that training opportunity work,” says Thompson. Given the unprecedented market downturn that occurred in the lumber industry in 2008, the year of the fire, Millar Western asked itself some hard questions about whether a rebuild would be the right move. Three infeed decks equipped with Linden step feeders transport the CTL logs into the Fox Creek sawmill. They are processed through one of three Nicholson debarkers. It was during this time that the company recognized a unique opportunity to purchase the assets of the mothballed Wapawekka sawmill in Prince Albert, Saskatchewan. Millar Western hired New West Mill Installations, a division of the New West Industries Group of Companies to disassemble the Wapawekka facility down to its nuts and bolts, and later re-assemble it in Fox Creek. “What we brought from Wapawekka was an entire building and floor steel, including log decks, debarker, conveyors, decks, electrical machine control centres, compressor systems, sorter and stacker system, fire protection system, two newer dry kilns, and all the associated parts that would go with a facility of that size,” says Demharter. Construction on the Fox Creek sawmill began July 2010. All that remained of the old sawmill was the sorter, half of the sorter building, the stacker and some old log decks at the front end, which were replaced as part of the reconstruction. The planer mill was still intact and was fairly modern, as it had been rebuilt by the previous owners in 2003, but there was room for improvement. Upgrades to the planer mill became part of the reconstruction project, and were completed in January 2012. 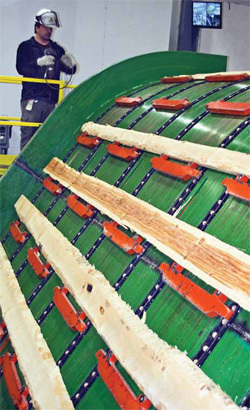 The Fox Creek sawmill design reflects the forest profile surrounding the facility, which means having the ability to process logs in the 4” to 20” diameter range. It also has the ability to react quickly to changes in market demand and the ability to process mountain pine beetle-attacked wood. For example, both the large canter line and the peewee canter line are capable of producing a variety of dimensions on-the-fly, using advanced shifting arbor systems that employ scanning technology that calculates the highest amount of potential recovery and value return from each log. “We try to maximize the value added in every process and every piece of equipment that we have, whether it is how we are breaking the log down or how we further process lumber,” says Thompson. The power of advanced scanning and production management technology is evident throughout the new mill, including the application of USNR’s linear high grader (LHG) in the planer mill. It is machine-based lumber grading technology, with only a single human check grader needed on the line to monitor the system’s accuracy. The LHG not only gives the capability to grade lumber based on surface appearance, but also to see through each board to identify any potential subsurface defects. “We’ve had extremely good results using this system throughout our entire product mix,” says Darcy Veillette, quality control supervisor. The Fox Creek mill now has the capability to pull a range of specialty products—appearance grades, J-grades for the Japanese market, squares for the remanufacturing sector, as well as decking—from its flow of dimension lumber ranging from 2 X 3 to 2 X 10, up to 16’ lengths. He adds that success in the specialty market takes commitment: customers need to know that Millar Western will continue to meet their requirements whether the lumber market is up or down. harvest is lodgepole pine. At present, about 78 per cent of the logs entering both the Fox Creek and Whitecourt mills come from beetle-attacked stands. Three infeed decks equipped with Linden step feeders transport the CTL logs into the Fox Creek sawmill. They are processed through one of three Nicholson debarkers. Two are new A8 dual ring, pressure controlled debarkers, and one is an A5 acquired from Wapawekka. The debarker conveyors feed three sort decks for the large log line and one sort deck for the small log line, which are again equipped with Linden step feeders. The main breakdown units are an Optimil quad saw canter, and an Optimil peewee canter. The Optimil canter with quad saw capability is described as a true double length infeed with auto-rotation correction, a shifting vertical double-arbor gang, and a top board separator and single arbor sawing capability. The Optimil small log line also has profiling capability on the top and bottom boards. 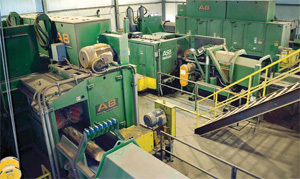 Both lines feed to a single trim deck, leading to a Newnes-optimized trim line, then to a 71 bin USNR pusher style sorter and USNR stacker with automated stick placing. An extension was added to the planer mill building to accommodate a new infeed line featuring a Mill-Tech Industries continuous tilt hoist and a Wolftek Industries bridge feeding the existing 612 Stetson-Ross planer. Once planed, the lumber enters the USNR lineal high grader, leading to the existing Newnes trim line, which was installed in 2003. Changes were made on the backend, creating a prime sort line and stacker to complement the existing stacker. Both stackers discharge to a Signode strapper and Mill Tech Industries wrapping station. Mill Tech also supplied the paper feeder and cutters as well as two lath placers. The main mechanical contractor on the Fox Creek sawmill reconstruction project and planer mill upgrade was Winfield, B.C.-based New West Industries. The main electrical contractor was KJ Electrical from Nanaimo, B.C. The engineer on the sawmill project was WOODPRO Engineering and on the planer mill, GME. The pre-engineered buildings for the sawmill, planer mill, and kiln control room were supplied by Brytex Building Systems Inc. Western Integrated supplied the MCCs for Fox Creek. Employees at the Millar Western Fox Creek sawmill trained at the company’s Whitecourt sawmill for months prior to the opening of the Fox Creek sawmill in November 2011. The company gives full credit to Fox Creek employees for their achievement in bringing both the sawmill and planer mill back to full production.